We’re going to put together a basic series this month on what kind of gear we use for riding in Frederick. Not all of us at the shop subscribe to this program, but maybe 75% of us do. The series will also provide an idea of what kind of bike and gear works well on a long unsupported ride, such as the Bike Doctor Grand Fondue we are putting together, on the 28th of October. 99.9 miles of riding means you have to pack most of the food you want to eat with you, and cooler weather means storage space for layers. Riding into the evening means you have to think about lights, and riding into bad weather is always something to be prepared for. We have a few names for this style of bike. Gravel roads bike. Randonneuring bike. Light Touring. Sport Touring. All Road bike. Whatevering bike though, I think best fits what this bike is up to. As in, it’s up for almost whatever you throw at it. Obviously it’s not a mountain bike, but you can take it on some pretty twisty singletrack if you ride it carefully. It’s not a loaded touring bike, but the fat tires and rack mounts let you take it into the mountains for a night of camping. It’s not a race bike, but the main thing holding back your top speed is always your legs, not your bike. A stable bike with good tires will descend faster and more confidently than a ‘nimble’ bike with narrow high pressure tires. Locally built bike for local riding. This sombre fellow was built by local custom frame builder Jeff Buchanan. Here’s some basic details of what makes it a good whatevering bike. The tires are bigger. Wide 28mm tires have more volume than a 23mm racing tire. That means lower pressure, less flats, better traction and a nicer ride. These are run between 65 and 85 psi, depending on the ride. That means versatility. Think 65 psi is slow and soft? Tom Boonen won a huge spring classic race (Paris-Roubaix) at 60 psi with even wider tires. He didn’t win because his tires were slow! Lots of spokes. Having 32 or 36 spokes means your wheels can take a beating and still come out on top. Good light wheels with lots of spokes are repairable, and even if you are unlucky enough to break a spoke on a ride, you have at least 31 more to keep the wheel together. With a 20 spoke wheel, good luck getting home, even with your brakes open. High spoke count wheels generally use normal J bend spokes, which you can source at any bike shop, if you do need to get them repaired. Bladed spokes, proprietary spokes, alloy spokes… all of that is usually special order stuff, which costs more and takes more time to install. Lest you think that lots of spokes means heavy wheels, it really doesn’t have to. One of the nice race oriented Mavic Wheelsets we sell is the Kysrium SL wheelset. It clocks in at about 1550 grams for the set. A typical high end set of handbuilt 32 hole wheels is about 20 grams heavier, but with 20 more spokes. You could easily make up that difference with a lighter tube. Fenders. Fenders are a point of contention. Some people love how they look, and others hate them so much that they won’t even consider their positive points. But let’s at least look at why fenders make sense, and debunk some myths. Myth #1: fenders make you slow. The biggest air turbulence on your bike comes from the tops of the tires. (besides you, of course) At the top of the revolving tire, air is whipped into a frenzy, and gets really aerodynamically messy. A fender hides that part of the tire from the air, negating the turbulence. Myth #2: fenders are heavy. Cheapo fenders, and steel fenders ARE heavy. 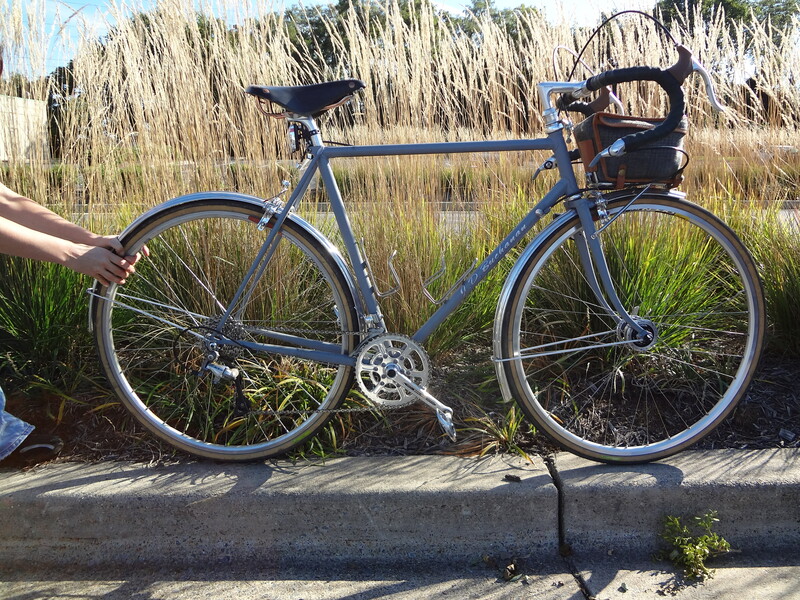 But lightweight french style aluminum fenders are light and stiff and plenty durable for whatevering. Fenders protect your feet from road spray, so if it just rained, no wet feet. If it is raining, no crud trail up your back, or mud in your eyes. Your drivetrain stays cleaner too. All good things. Plus: they are shiny. Low gears. Not everyone needs low gears for everyday riding, but this is a whatevering bike, built to take on whatever the rider wants to do. Some steep fireroads…. a quick camping trip on a mountain? Gotcha covered, if you have low gears. The thing about low gears is even if you don’t use them on every ride, carrying them around won’t hurt you. Storage. Some people like to wear jerseys and stuff everything into the pockets in the back. But try putting a jacket, a nice camera, a sandwich, arm warmers, some magic food, spare tubes, a real pump, a multi tool, warmer gloves, a wallet and a handkerchief into those pockets. If you do get them in there, the sandwich will get mushed, you will drop the camera trying to remove it, and the magic food will taste like rubber. Also, you will look like Quasimodo with that big bulge back there. Get a basic bit of luggage for your bike. You bike lacks rack mounts? Sad day, but not insurmountable. Get a nice Ortlieb handlebar bag that clips to your bars. You can fit everything listed in there, and still put a cue sheet on the top. Storage is your friend, and having the ability to bring layers on a cool day makes riding way more enjoyable. Optional whatevering items: Pedals that have cleats that let you walk around, rather than hobble around. Comfortable bar height, so you can look around, not just at your power meter. Steel Frame, for durability and ride comfort. Strong brakes with good brake pads, for hauling you and your overnight gear to a stop when the deer jumps out in front of you. Built in lighting. Generator (dynamo) front hubs let you ride all winter without having to constantly charge a light. Surprisingly low drag, and lots of light. Roughly 300 lumens, forever. The bike above has two front wheels, a summer wheel and a whatevering wheel. The whatevering wheel, pictured, has the dynamo hub laced up. We have a few whatevering bikes available for demo purposes. Stop by the shop to find out more! You could even check one out for the Grand Fondue ride. Dan the Younger’s whatevering bike was just posted on our facebook page as part of our new series on what the Bike Doc staff rides. Check it out here. The Bike Doctor Frederick Grand FondueIs coming up here at the end of the month. There are two rides, for those who don’t know yet. 99.9 miles and 35ish miles. The 99.9er will have loads of climbing and plenty of dirt roads (about 20 miles worth). The shorter ride will have way less climbing, and only 3 short dirt sections, which are really well groomed. The big guy will have a bailout at roughly 65, if you are dead by then. The ride is the last Sunday in October, which is the 28th. Both rides are only 15 bucks, plus a block of cheese for the communal fondue at the end. That 15 bucks gets rudimentary sag support, basic mechanical support, a few glasses of wine or mead at the end, and access to the communal dinner. We’re starting and ending at the beautiful Orchid Cellar Winery in Middletown MD, where part owner Andre (also a mechanic at the shop) will be hosting us. Also, great local band “The Galt Line” just signed up to play, and they are a ton of fun. We figure that’s quite a bit of goodness for just 15 bucks. 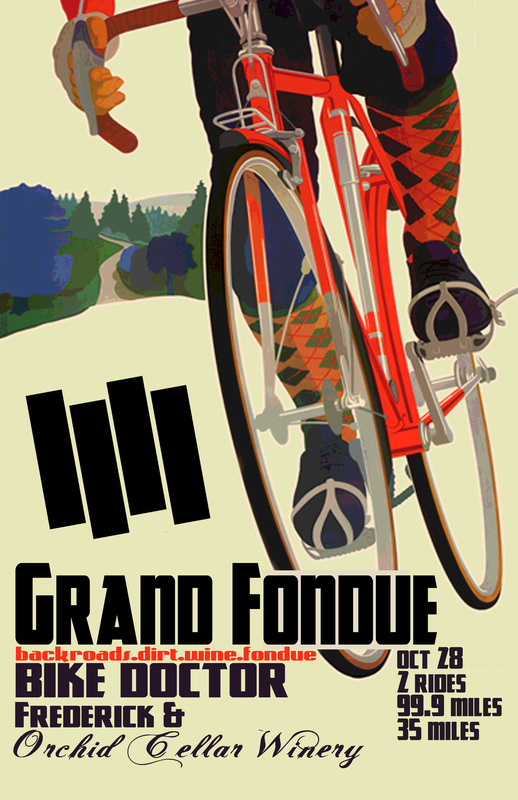 The other ride that is happening that month, the Grand Fondo, which sounds suspiciously like our Fondue, is 100 bucks, and no band and no wine! Preregister (we need head counts sooner rather than later) even if you don’t know which ride you want to do. Send us an email at bikedrfrederick (at) gmail (dot) com to do paypal, or just stop by the store with cash money. Please have exact change, it will make our lives easier. If you just have a 20, we’ll give you a Frederick Bicycle Coalition waterbottle, but no change. Clinic season is upon us. Sign up in advance for individual classes (some have size limits). Almost all are free. We have a big listing of all of them, here. This Wednesday, we’ll be doing our popular fix a flat clinic, which is a comprehensive look at how to fix flats, cut tires, and how to use moss as a tube. Here’s the rest of the month’s breakdown, but really, go here to see the full deal. 10/3: Fix a Flat. Comprehensive look at flats and how to fix them. Topics include: tire booting, patching, checking for stuff in the tire, and installation. 10/10: Basic Tri Bike maintenance: Brian will teach the ins and outs of how to care for your tri bike, including cleaning, adjusting stuff in the middle of a race, and pre race inspections. 10/17: Touring and Bike Camping basics. We’ll talk about need vs want, where to get stuff, and how to use it. 10/31: Winter Riding Clinic: clothing and equipement to stay warm and safe. Learn about practical layering, embrocation, and hydration.